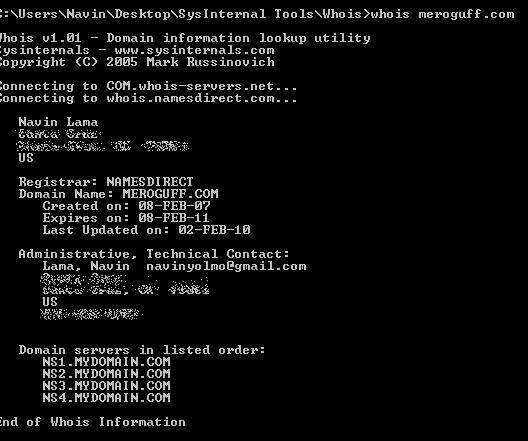 How do you 'whois' a domain? 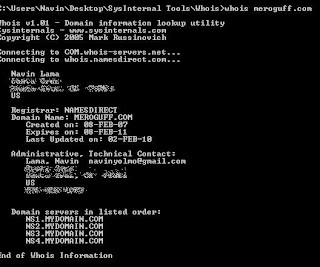 As a Windows User, most probably you would have no option other than using third-party websites like whois.net to query any domain. 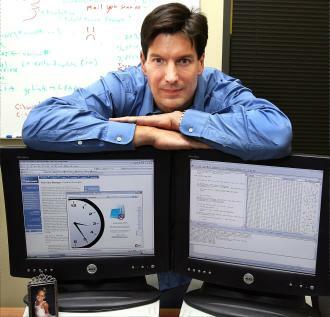 But Sysinternal's Mark Russinovich(who is now with Microsoft) created small whois DOS application many years ago. and you'll see the business,administrative and technical contacts with informations such as email and phone number as well. I've almost all applications made by Mark Russinovich stuffed into one USB flash drive and I use it when necessary. It's like a swissknife to troubleshoot most of the Windows PC problems. I recommend have a read before using those tools. It's simple to understand. And the fun part is, you'll leave your client dazed with what you did using all those command prompts typing. They'll give you a look as if you are an uber geek. Many many thanks to Mark for his wonderful programming, and if you are a computer nerd like me, you can get almost all of his wonderful tools in one simple download. They named it Sysinternal Suites. One more thing, I've tested it and works on Windows XP and above. I'm on Windows 7 professional edition. These tools are gems to own.